Religion in Schools -- Permissible Prohibition or Free Speech Violation? The dust has finally settled around the controversy over student speech in the "I Heart Boobies" bracelet case, and now another school in the Third Circuit has come under fire for potentially violating a student's right to free speech. Though there's never a clear line drawn as to what kind of speech can be prohibited, this case is a particularly difficult one because the speech being prohibited is religious in nature. At the intersection of religious speech, and permissible prohibitions on speech at schools, lies the case of the religious Valentine's Day cards. J.A., a first grader at Shafer Elementary School in Nazareth, Pennsylvania planned on distributing Valentine's Day cards to his classmates with the following message: "St. Valentine was imprisoned and martyred for presiding over marriages and for spreading the news of God's love. In honor of St. Valentine's Day, I want you to know that God loves YOU!!!!" The message was followed by a Bible passage, John 3:16, reports The Express-Times. When the teacher noticed the religious nature of the message, she informed the principal who directed that the notes be taken out of the cards before distribution to the class. The principal cited a rule prohibiting the dissemination of religious materials in school. J.A. 's mother called the principal and he explained the school's position. Dissatisfied with that result, J.A. 's father emailed the superintendent that evening claiming that the principal violated his son's First Amendment rights. The superintendent replied, "I have forwarded your concern to our attorney and will wait for his reply." The Alliance Defending Freedom took up J.A. 's cause, and J.A. 's parents filed a complaint in the District Court for the Eastern District of Pennsylvania under 42 U.S.C. § 1983 alleging violations of the First Amendment, Fourteenth Amendment, and Pennsylvania Religious Freedom Protection Act. The family seeks injunctive relief prohibiting the school from enforcing its policy against distributing religious information. They also seek a declaratory judgment that the policy violates J.A. 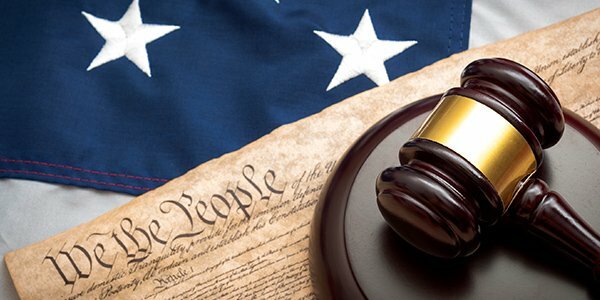 's First and Fourteenth Amendment rights, as well as nominal damages and attorneys' fees. This case is of particular interest because of the two competing interests -- religious expression and free speech. Because the speech takes place in school, there are additional factors at play that will determine how this case is decided. In 2003, the Third Circuit upheld a school's policy that prohibited a student from distributing religious pencils to other students, while last year, the Third Circuit allowed a student to give out invitations to a Christmas party at a local church, reports The Express-Times. While this case seems more like the pencil case at first glance, it will be some time before this case comes before the Third Circuit -- though we're pretty sure that the case will be appealed regardless of how it is decided.